Nutrition intervention is a major component of the fight against any disease. Providing clients with nutrition solutions focused specifically on supporting brain health and avoiding chronic disease may help prevent cognitive decline and age-associated diseases. According to the Natural Marketing Institute, 55% of baby boomers fear the loss of mental capacity. In fact, 41% fear their brain fitness has decreased during the past 10 years. Even though recent reports, such as a 2008 article in Alzheimer’s & Dementia, have indicated a decline in dementia among older adults, baby boomers remain concerned about their brain health. Fortunately, an array of nutritional information is available concerning the prevention or delay of chronic and age-related disease. Nutrition professionals can use the resources to find solutions for promoting cognitive health among baby boomers. According to the U.S. Census Bureau, baby boomers represent 77.3 million people in the United States. When the youngest of the baby boomers reaches retirement age, 20% of the U.S. population will be aged 65 or older compared with 13% today. Lifestyle changes and medical advances have extended baby boomers’ life expectancy by 20 years, according to the Centers for Disease Control and Prevention (CDC). But even though boomers are expected to live longer, the prevalence of chronic disease among them is growing. This population is demonstrating a widespread incidence of obesity and related chronic diseases, such as type 2 diabetes, hypertension, hypercholesterolemia, heart disease, and cancer, according to findings from the CDC and the Commonwealth Fund. Recent findings suggest that diseases of the body can often affect the brain. There also is evidence that links obesity, high blood sugar, high insulin levels, high blood pressure, inflammation, and cardiovascular concerns such as elevated homocysteine levels to various forms of dementia and AD. Based on 2009 findings from the Alzheimer’s Association, approximately 5 million Americans currently have AD. This statistic includes mostly people over the age of 65; however, also included are the 200,000 people under the age of 65 with early-onset AD. Estimates indicate that by 2030, one in eight baby boomers will develop AD. And unfortunately, the Alzheimer’s Association expects these numbers to grow unless researchers find ways to treat and eventually prevent the disease. AD is characterized by a buildup of proteins called plaques (beta-amyloid) and tangles (tau), which can destroy brain cells and prohibit effective communication among neurons. Although the development of these proteins is associated with aging, autopsy studies have discovered that people with AD have much higher levels of both beta-amyloid and tau, according to the Alzheimer’s Association. Scientists are now suggesting that the Alzheimer’s brain has a diabeteslike condition called type 3 diabetes, which results from high insulin levels in the brain.2-4 In addition, research has established that people with hypertension and high cholesterol are more likely to have a stroke, which impairs cognitive function.5 High homocysteine levels and elevated C-reactive protein are indicators of an inflammatory response and vascular issues in the heart, which can also lead to stroke and impaired brain function.6 Obesity alone can increase the likelihood of impaired cognitive function or dementia. Estimates suggest that individuals who are obese are at a three times greater risk of developing AD and a five times greater risk of developing vascular dementia than normal-weight individuals due to an increase in fat cells and hormone response, according to articles published in 2007 in Current Alzheimer Research. Following interviews with nutritionists and RDs from conventional and alternative practices, it seems the best approach to nutrition therapy for cognitive function should be preventive and integrative. Nutritionist Larry Segal, RPH, suggests cognitive decline is due to an inflammatory response in the body and the relationship to heart disease and diabetes. Heart-healthy, diabetic, and anti-inflammatory foods and supplements should be incorporated into the diet and lifestyle of individuals seeking assistance to address the root of the problem. Lori Sacco, RD, believes in adding brain health foods and supplements to a Mediterranean diet-based meal plan. More than 50 years of epidemiological and experimental nutrition research shows that diets from the Mediterranean region are associated with the lowest rates of chronic disease and the highest adult life expectancy. In addition, higher adherence to a Mediterranean diet has been associated with slower cognitive decline and may act as a safeguard against AD.7 The Mediterranean diet is a good alternative to the standard MyPyramid because it focuses specifically on chronic disease prevention and cognitive function. In studies conducted in 2007 by the CDC, middle-aged people reported using complementary and alternative medicine more often than either older or younger people. Regardless of protocols and practices, professionals must assess people’s needs and wants and open their own minds to all options to best support their clients and patients. An array of well-researched evidence suggests that eating wholesome, healthy foods and adding nutritional supplements to augment what diet alone cannot provide is a reasonable plan for nutrition management—thus, total nutrition. Educating the public about balancing safe and adequate food and supplement intake is a responsible approach when providing nutritional therapy. In addition, nutrition professionals should strongly recommend that people incorporate this information into their lifestyle. Consider the information provided in the accompanying table when designing nutrition solutions for promoting cognitive health. In the past, AD was considered untreatable because risk factors such as aging and genetics could not be controlled. However, recent scientific findings suggest controlling the risk factors for obesity, cardiovascular disease, and diabetes may delay the onset or decrease the possibility of developing AD or dementia. Since aging baby boomers may already be faced with these coexisting conditions associated with AD and dementia, nutrition professionals must continue to focus on chronic disease prevention and additionally provide nutrition solutions that specifically address improving cognitive function for this population. — Jeanne Marie Maglione, MS, RD, has more than 20 years’ experience in food, nutrition, and dietetics. She currently works as a nutrition consultant integrating natural products into traditional medical practices. 1. Lindsay J, Laurin D, Verreault R, et al. Risk factors for Alzheimer’s disease: A prospective analysis from the Canadian Study of Health and Aging. Am J Epidemiol. 2002;156(5):445-453. 2. Dyer O. Is Alzheimer’s really just type III diabetes? Advances in Medicine. 2005;2(21). 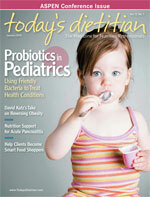 Available at: http://www.nationalreviewofmedicine.com/issue/2005/12_15/2_advances_medicine01_21.html. Accessed November 8, 2009. 3. Steen E, Terry BM, Rivera EJ, et al. Impaired insulin and insulin-like growth factor expression and signaling mechanisms in Alzheimer’s disease—is this type 3 diabetes? J Alzheimers Dis. 2005;7(1):63-80. 4. Grens K. Alzheimer’s: Type 3 diabetes? Neurodegeneration research turns to insulin for answers. The Scientist. 2007;21:78. 5. Narang AP, Verma I, Kaur S, et al. Homocysteine—risk factor for ischemic stroke? Indian J Physiol Pharmacol. 2009;53(1):34-38. 6. Seshadri S, Beiser A, Selhub J, et al. Plasma homocysteine as a risk factor for dementia and Alzheimer’s disease. N Eng J Med. 2002;346(7):476-483. 7. Knopman D. Mediterranean diet and late-life cognitive impairment: A taste of benefit. JAMA. 2009;302(6):686-687. • Alzheimer’s Association. Alternative treatments. Last updated July 30, 2009. Available at: http://www.alz.org/alzheimers_disease_alternative_treatments.asp - phosphatidylserine . Accessed November 2009. • Arendash GW, Mori T, Cao C, et al. Caffeine reverses cognitive impairment and decreases brain amyloid-beta levels in aged Alzheimer’s disease mice. J Alzheimers Dis. 2009;17(3):661-680. • Aubrey A. Getting brain food straight from the source. National Public Radio. November 7, 2007. Available at: http://www.npr.org/templates/story/story.php?storyId=15823852 . Accessed November 2009. • Blumenthal M. The ABC Clinical Guide to Herbs. Austin, Tex. : American Botanical Council; 2003:185-202. • Burns NR, Bryan J, Nettelbeck T. Ginkgo biloba: No robust effects on cognitive abilities or mood in healthy young or older adults. Human Psychopharmacol. 2006;1(1):27-37. • Cleveland Clinic. Heart-health benefits of chocolate unveiled. Available at: http://my.clevelandclinic.org/heart/prevention/nutrition/chocolate.aspx . Accessed November 2009. • Durga J, van Boxtel MP, Schouten EG, et al. Effect of 3-year folic acid supplementation on cognitive function in older adults in the FACIT trial: A randomised, double blind, controlled trial. Lancet. 2007;369(9557):208-216. • Evans SJ, Burghardt PR. BrainFit For Life. Milan, Mich.: River Pointe Publications; 2008:58-87. • Fairfield KM, Fletcher RH. Vitamins for chronic disease prevention: Scientific review. JAMA. 2002;287(23):3116-3126. • The Franklin Institute. Resources for science learning: Introducing the brain food pyramid. Available at: http://www.fi.edu/learn/brain/pyramid.html. Accessed January 2010. • Hendler SS, Rorvik D (eds). PDR for Nutritional Supplements, 1st ed. Montvale, N.J.: Thomas Healthcare; 2001:117-121, 354-356. • Herr SM. Herb-Drug Interaction Handbook. 3rd ed. New York: Church Street Books; 2005:76, 135-141, 324-346. • Johnson-Kozlow M, Kritz-Silverstein D, Barrett-Connor E, Morton D. Coffee consumption and cognitive function among older adults. Am J Epidemiol. 2002;156(9):842-850. • Jorissen BL, Brouns F, Van Boxtel MP, et al. The influence of soy-derived phosphatidylserine on cognition in age-associated memory impairment. Nutr Neurosci 2001; 4:121-34. • Klein S, Rister R. The Complete German Commission E Monographs. Boston: Integrative Medicine Communications; 1998:222. • Linus Pauling Institute at Oregon State University. Micronutrient information center: Curcumin. Available at: http://lpi.oregonstate.edu/infocenter/phytochemicals/curcumin. Accessed November 2009. • Mishra S, Palanivelu K. The effect of curcumin (turmeric) on Alzheimer's disease: An overview. Ann Indian Acad Neurol. 2008;11(1):13-19. • Natural Standard. Consumerlab.com reviews memory enhancement supplements. December 2005. Available at: http://www.naturalstandard.com/index-abstract.asp?create-abstract=/monographs/news/news200512006.asp. Accessed November 2009. • Ng TP, Chiam PC, Lee T, et al. Curry consumption and cognitive function in the elderly. Am J Epidemiol.2006;164(9):898-906. • Roizen MF, Oz MC. You: Staying Young: The Owner’s Manual for Extending Your Warranty. New York: Free Press; 2007:25-47. • Summaries for patients. Coffee and napping improve nighttime highway driving. Ann Intern Med. 2006;144(11):I11. • Vanderhaeghe LR, Karst K. Healthy Fats for Life: Preventing and Treating Common Health Problems With Essential Fatty Acids. John Wiley & Sons Canada; 2004:59-69. • van Gelder BM, Tijhuis M, Kalmijin S, Kromhourt D. Fish consumption, n–3 fatty acids, and subsequent 5-y cognitive decline in elderly men: The Zutphen Elderly Study. Am J Clin Nutr. 2007;85(4):1142-1147. Sixty percent of the brain is fat. DHA may be associated with dementia decline. (roughly 2 servings of fatty fish); for someone with heart disease, recommended intake is 1,000 mg. Difficult to get adequate amounts from food sources alone.